With astonishing views of the Acropolis in the distance and set on one of the city’s most fashionable avenues, the Hilton Athens has long been a landmark in the city. It is located minutes walk from the city centre, opposite the National-Art-Gallery and close to many major companies and embassies. In each of the 508 modern and spacious guestrooms and 34 suites, the emphasis is on elegance and comfort. The guest rooms are appointed with minimal décor and are spacious, offering their own balconies with views of either the Acropolis or Lycabettus hill. Generously sized bathrooms are naturally lit, with separate bath and shower suites and the added luxury of a monsoon shower. 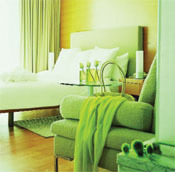 The hotel’s 34 suites range from business suites to the 220 sq.m. Presidential Suite, which features a private Jacuzzi tub that looks out over the Acropolis. Guests staying on the executive Floor have exclusive sanctuary to a club-room with Acropolis view, private reception area, complimentary breakfast, drinks and cocktails throughout the day as well as free access to the health club and spa. 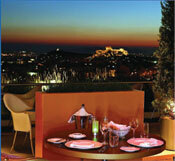 There are abundant dining options at the Hilton Athens. The “Byzantine”, “Milos”, “Galaxy Roof”, “Aethrion Café-Lounge” and “Oasis Pool bar & Grill” are sure to satisfy even the most discriminating appetites. 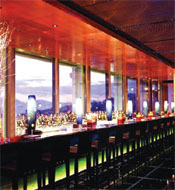 The “Galaxy Bar” is a popular nightspot for local Athenians and offers guests the best views of Athens. 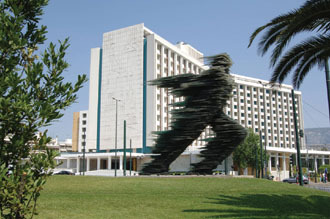 At the Hilton Athens guests have the chance to experience one of the most luxurious health and fitness centres in Athens: an outstanding 1200 sq.m. Health Club with sauna and steam room, a Pilates Studio, massage rooms, indoor swimming pool and spa services. Other facilities include the largest outdoor pool in Athens, Beauty Salon, Car Rental Desk, ATM, Parking, Arcade of Shops, News Stand and Barber’s Shop. Hilton Athens offers the latest in conference, incentive and banqueting facilities and is the ideal choice for the conference organizer. There are now 22 conference rooms and exhibition areas since Hilton Athens has extended its Hilton Meetings™ capacity with four more meeting rooms. The main ballroom seats 1600 delegates and has hosted some of the most important conventions in the world. 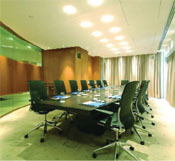 There are versatile rooms for all kinds of business and social events with natural daylight, wireless high-speed internet and a fully equipped Business Center to cover all your secretarial needs.